Why do some business storytelling efforts fail spectacularly? I hear sponsors of some of these failed attempts (they’re brave enough to call us in after their bad experience) saying, “storytelling just didn’t suit our culture” or “we just didn’t click with the person we brought in to help us.” I suspect these are merely superficial explanations. The storytelling spectrum is a simple but useful idea I learnt from my friend and storytelling expert Mary Alice Arthur. Imagine a spectrum of storytelling. At one end is Big ‘S’ Storytelling which includes those beautifully crafted stories we see in movies, novels, plays and even the latest Playstation games. Big ‘S’ Storytellers understand plot structures, character development, scene design and a myriad of other storytelling principles and practices. At the other end of the spectrum is Small ‘s’ Storytelling where we find the stories we tell on a daily basis in conversations, anecdotes, recounts and examples. We’ve focussed our attention on the Small ‘s’ end of the spectrum (the anecdotes, the real life experiences) and have inched our way toward the Big ‘S’ end, but not too far for reasons I’ll explain in a moment. There’s lots to learn from the Big ‘S’ end but business people don’t need to be screenwriters or playwrights. Putting too much storytelling craft in how you communicate can lead you to fall into an even bigger trap. And this trap is similar to one discovered in robotics in the 70s. In 1970 a Japanese robotics researcher, Mashahiro Mori, noticed that as he made his robots more humanlike their attractiveness increased, but only to a point. After that they became creepy. It was only when it was impossible to tell the robot from the human did they become attractive again. Mori called this dip in comfort levels (Shinwakan) the Uncanny Valley. Source: Crossing the uncanny valley, The Economist, Nov 18th 2010. We witnessed the impact of the Uncanny Valley at the movie theatres in 2004. Pixar released The Incredibles at the same time Warner Bros. released The Polar Express. The Polar Express used live action performance capture techniques to make almost humanlike animated characters with an eerie result; not what you want for a Christmas tale. The Incredibles were clearly animations and it became a box office hit. 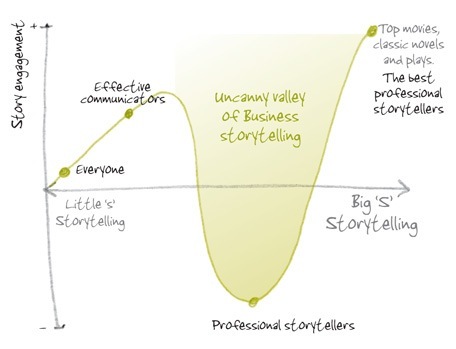 There is something like an Uncanny Valley of Business Storytelling. We can improve our storytelling with techniques applied from the wealth of storytelling techniques used by the best screenwriters, playwrights and novelists, but only to a point. After that business storytelling drop into an Uncanny Valley. At the bottom of the valley the storyteller’s efforts seem artificial, forced and clumsy. Sometimes this happens when people in the organisation believe they need to understand sophisticated plot structures, vocalisation techniques and beats and scenes to apply storytelling. Frankly, I think you can love storytelling too much and try too hard. Sometimes a storytelling professional believes that to be a real storyteller you need to be a performance storyteller. This often results in the storytelling voice. You know that one that sounds like the person has just started a children’s story with Once Upon a Time. Again the result is the Uncanny Valley. Yes, you can learn a lot from Big ‘S’ Storytelling but it’s folly to try apply too much. In the end so much can be achieved just helping people to be mindful of their experiences and the experiences of the people around them and work out what these experiences mean. With this understanding recounting an experience can be a powerful illustration of what you believe is important. And told as a story on the gentle hills above the valley will mean people with remember it and maybe even be inspired to take action. Great article. I think this uncanny valley applies in lots of contexts to do with communication: recorded music, for instance (well-conceived and executed ‘lo-fi’ recording may work better than over-ambitious, production-heavy studio work that fails to attain truly big-budget levels). I think it’s easy to become self-conscious about storytelling. So many charismatic speakers – people who spin a brilliant story down in the pub after work – become straitened and false when they set out to write a story. Because they try way too hard, I think. Hi Tom, the hi-fi vs lo-fi example is a good one. Writing the story is always much harder and in many cases almost impossible for people to do. Unless you’re a writer it’s a daunting task. It’s why video and audio is so important when you are collecting stories. We made sure we added these features in our storybank website, Zahmoo (to be launched shortly. Follow @zahmoo on twitter if you want to get the first invite to try it out). I think even just having this vocabulary to help point out the difference to business storytellers will go some way to giving them the awareness of what they’re doing so they can relax and be more natural. Great work. Nice one Shawn. There are lots of “valleys to cross” in management consulting metaphors, but this is an original pair of axes. The pitfall of (merely) “professional” story-telling is very close to Dave Snowden’s recent post about the “tent” approach to formally telling your employees the “official” culture and hoping it will have any beneficial effect. When things look merely professional – a perfect simulation of the real – they are naff, to be the best professional, they have to “appear” natural by actually being “natural”. Not exactly on-topic, but the art of telling a good story from England cricket coach, Bumble. Thanks Ian. I differ from Dave in that I believe there is considerable value in learning and telling stories in the organisation. How they are told is really my focus in this blog. Make them too polished and try to apply too much from story craft and you tumble into the valley. I loved Brian Boyd’s book. I will have to check out The Art Instinct. The video is a beauty Ian. Trying too hard and producing what you called a “storytelling voice” is bad in performance storytelling too. Storytelling voice does not really exist and if it does – something is wrong, unauthentic,trying too hard to “be” something one might think is the right thing to be. The only added component to voice in storytelling is intention concerning the events in the story, the way the teller feels about them and the need to project so the audience can hear what you are saying. Just like in real life.